Innovation, visioning and motivation describe a group of youth in one local congregation who has been captured by the devastating effects of AIDS in their country. Such awareness is spreading. 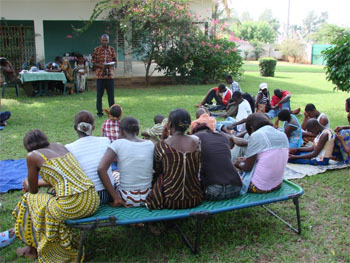 Hope International trained these young people to raise awareness of AIDS, in emphasizing abstinence and faithfulness to their peers (14-25 years). Such biblical conduct is the key to turning the tide of this pandemic. Their passion drives them to encourage youth to dedicate themselves to wait until they are married before becoming sexually active and to get themselves tested for the virus. Last year they carried out 15 activities on a minimal budget, reaching approximately 2000 participants in a city and in several villages. Their vision for this year and beyond is to extend their program, multiplying their activities, reaching places in the country where they have not yet entered. The compassion side of this ministry has enabled victims who are often abandoned by their families to get assistance in treatment for their illnesses during a set back after receiving anti-viral medication. Such mercy draws the hopeless to the family who cares - the church.